Stelrad Radiators has a good track record of helping in particular, locally based charities, when the call for help has come its way. The Burton Street Foundation in Sheffield is an incredible charity that for more than twenty- five years has been providing support for youngsters and older people with learning difficulties or physical disabilities – right across the Sheffield area. It’s formed a small community in the Burton Street area of Sheffield and it now has more than 50 organisations – community groups and small businesses – working with and alongside them, in the myriad of buildings that they now have on site. The Burton Street Foundation is now expanding onto another site – just across the road from its main base in Burton Street, Hillsborough. The new ‘Bamforth Building’ offers work spaces for new enterprises and community activities, as well as creating additional space for Burton Street Foundation sessions, including an independent living bungalow to support those wanting to gain the skills needed to live alone. It will also host a new project supporting adults with learning disabilities to fulfil the wish of many of them to find their way into employment. Previously a dis-used factory, the building has been totally revamped to provide a space that can be used by able bodied and disabled people alike, following the Burton Street Foundation’s mantra that its vital for able bodied and disabled people to mix on a daily basis and learn from each other in a common environment. The new building offers a number of dedicated areas for different activities along with a large main space that can be hired by local people for parties and events as well as used for regular classes and for organisations to make the most of on a daily or weekly basis. 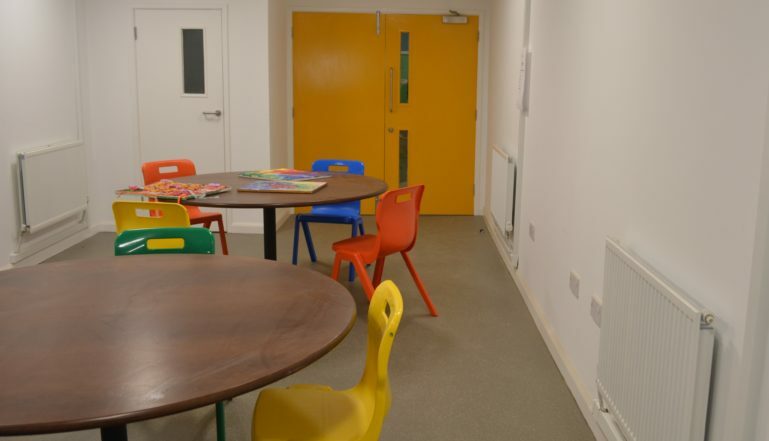 The areas include a large soft play area, a media centre where groups can learn IT skills and a music centre where youngsters can make as much noise as they like! In addition, there is a creative centre for art and design activities. The most interesting area of the new building is ‘the bungalow’. Within the safety and security of the larger building, the Foundation has built a bungalow with a large kitchen usable by everyone including those in wheelchairs, a living room, a bedroom and a bathroom, to help teach people with learning difficulties how to live safely and happily in their own space – learning the necessary skills of living on your own from cooking and cleaning to knowing how to control your heating system, and keep your environment safe. Many charitable and commercial organisations have contributed towards the refurbishment of the space with Kier taking a leading role with their apprentices putting in a huge amount of time and effort for the charity. 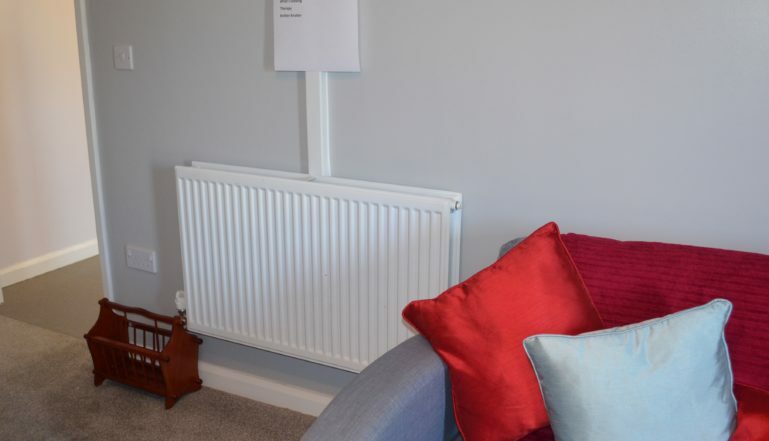 Teams of volunteers have also weighed in with help and many companies have contributed to the building including locally based Stelrad Radiators which contributed a large number of its Elite radiators to provide warmth from the new heating system installed in the building. 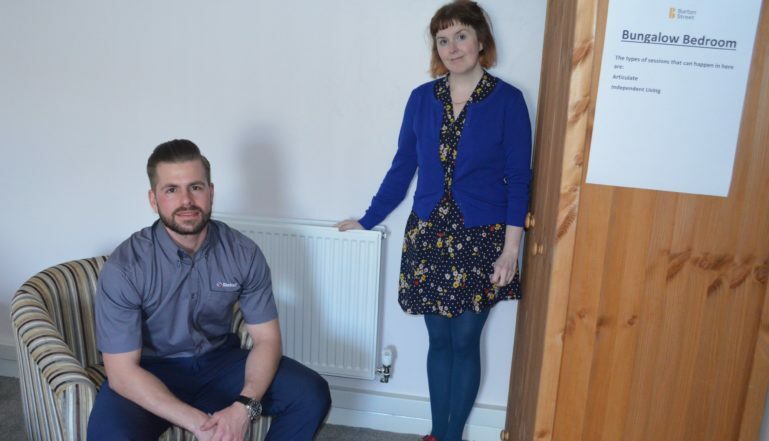 Stelrad's Joel Cumberbatch with one of the team at Burton Street admiring the radiators in the "bungalow" designed to help young people to learn how to live on their own. And more radiators in a communal area.